So how do you catch a finch? No, I'm not talking about stalking that sparrow sitting on your bird feeder in the back yard. I'm talking about catching and handling your pet finch whether it be from a cage, aviary or accidentally got lose in the house. If you've spent any time chasing a finch around in the hopes of snatching it from the air you've noticed that they are not easy to catch. If the finch was aviary bred and has a nice roomy cage you may find that you tire long before the finch's endurance runs out. When you do catch your finch please hold it gently by firmly. If the finch is being held too tight it will probably squeal and gasp in pain. That's never a good sign. If you hold the finch to loosely it will wiggle free and you'll be right back where you started. Learning to hold a finch isn't something easily described, it's just something you need to do a few times to get the feel for it. Well now it's time to learn a few tricks from those of us who have been catching, moving, and dealing with finches for many years. Method #1: Endurance Test. Yes you can simply chase the finch around the cage, flight or room in hopes that it'll tire and slow down enough that you can just grab it. This does work pretty well in smaller cages where the finch has less room to maneuver around your hand. Plus if you manage to corner the finch it'll be fairly easy to pick up. This method can be rather stressful for the finch and human alike. Method #2: Netting the Finch. You've probably seen bird nets of various sizes available from different websites. Even I offer a small net for catching from large cages and aviaries. When you do you a net inside a smaller space like a large cage or aviary it's best to remove all perches, swings and toys to give up an unobstructed swipe with the net. This will improve your chances of catching the finch quickly and cause less stress for the finch. If you need to net a finch that is flying around your home you'll need a larger sized net and if possible chase the finch in to a smaller room and close the door to lessen the chance of injury to the finch. You'll probably end up running around the room like a crazy person as the finch dips and weaves around you and the room so you may want to close the shudders so the neighbors don't think you've lost your mind. Plus with the shudders (or curtains) closed the finch is less likely to get hurt smacking in to the window. Remember that to a finch a closed window is a way out. They wont see the glass. The same holds true for mirrors. Finches can kill themselves if they hit a mirror or window too hard. Please note that when you use a net always swing slowly and gently. 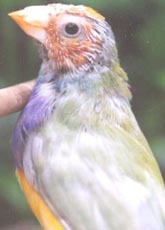 If the finch is in flight and flys in to the net as you are moving to catch the finch the sudden stop at the end of the net can cause injury. No abrupt movements and if you do have time to react, back the net off a bit as the finch enters to slow the bird down a gently as possible. Method #3: Hunt at Night. That's right, become a real night stalker. Finches need more light than humans do to see after dark. For this method you will need a friend to assist you. Someone must always keep a hand on the light switch in case the finch begins to panic. 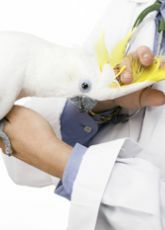 If you are catching from a cage or small aviary you can use either your hand or a small net. Put your hand/net inside the cage with the finch and hold completely still until it has settled down. Keep your eye on the target and tell your assistant to flip out the light. This will make the room instantly dark and that is when you strike. Whether you catch or miss your friend must turn the light back on as soon as fluttering is heard. If the light isn't bright back up quickly the finch could go in to a full night fright and thrash itself to death against the cage bars. If the bird is lose in a room don't kill the lights entirely just dim them and strike with a large net to decrease the chance of injury to the finch and yourself. Method #4: Soft and light weight Towel. When no net is handy try a towel. You don't even need a great deal of accuracy with this method. Just get the towel on top the finch and you'll have it caught. Towels work best in large open space like in rooms or your home. 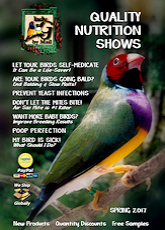 They are less effective in cages and small aviaries. Method #5: Setting a Trap. This is not always effective and almost never very fast but it can work if you are patient. This method is also only used on those finches that have gotten out of the cage and are now terrorizing your household. Eventually the finch will get hungry and thirsty. You can start by leaving cups of food and water outside the small cage/trap, then leave the room and let the finch explore on its own terms. As the finch learns their location move the cups inside the cage/trap. Again leave. Finally sneak back in while the finch is inside the cage eating and quickly close the cage/trap door. Like I said, this isn't terribly effective and is very time consuming but I wanted you to have all the options. One thing you should never attempt to do is to grab the finch by the tail. If you do this, the tail feathers will drop or be yanked out. This is painful for the finch and while it will curb the more elaborate maneuverability of the finch in flight it will not ground the finch. 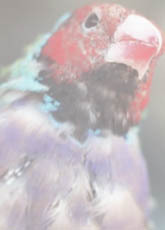 Plus if a bald finch is put in with other finches the finch will likely be attacked by the fully feathered finches.